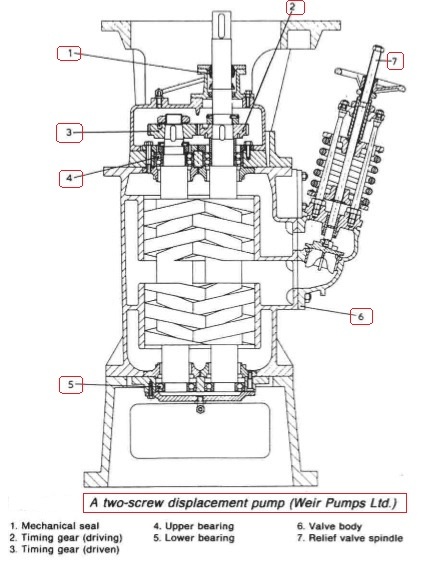 Both double-screw pumps, in which the screws are driven in phase by timing gears (Figure 1: two screw displacement pump), and triple screw pumps (Figure 2), in which the centre screw is driven and the outer screws idle are used at sea especially for pumping high viscosity liquids such as oil and some liquid cargoes. Being self-primning and able to pump liquid and vapour without loss of suction they are particularly useful when draining tanks of high vapour pressure liquids. They are suitable for operation at high rotational speed (units are in operation with speeds of 3500 rev/min, delivering over 1000 litres/min) and can thus be easily matched with standard electric motors. 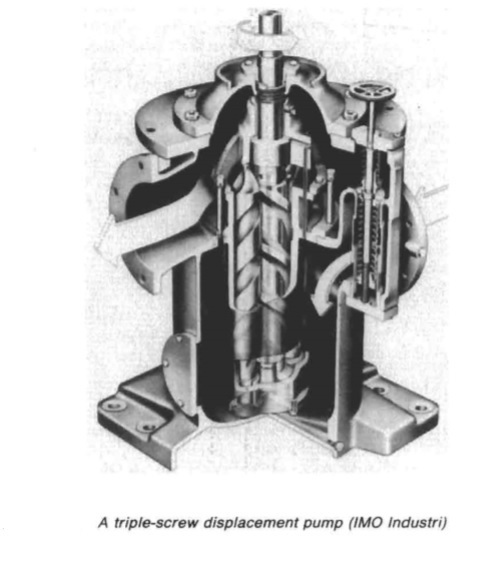 In the IMO triple screw pump the centre screw is driven mechanically, through a flexible coupling. The two outer screws are driven by the fluid pressure and act purely as seals. The screws work in a renewable cast iron sleeve mounted in a cast iron pump casing. When the screws rotate, their close relation to each other creates pockets in the helices; these pockets move axially and have the same effect as a piston moving constantly in one direction. These pumps work well at high pressure and with high viscosity fluids (up to 4000 centistokes). The axial thrust on the power rotor is balanced hydraulically, that of the idlers by thrust washers. This type of pump can be mounted either horizontally or vertically. Pumping is effected by two intermeshing screws rotating within a pump casing. Each screw shaft has a right and a left hand screw which ensures axial hydraulic balance, there being no load imposed on the location bearing. Metal contact is avoided by driving the screwshaft through hardened and ground timing gears. Once the casing has been filled with liquid, the pump is self-priming and ready for operation. Displacement on pumping occurs when the screws are rotated and liquid is drawn into the screws at the outer ends and pumped inwards to the discharge located at rotor mid-length. The discharge is without pulsation. When pumps are installed for handling non-corrosive liquids of reasonable lubricity, it is normal to find units with internal bearings. For handling corrosive chemicals, liquids with a lack of lubricity and/or high very high viscosity, designs incorporating outside bearings (Figure 3) which can be independently lubricated would be used. Pumps with inside bearings are shorter and lighter than their outside bearing counterparts and have only one shaft seal as against four. 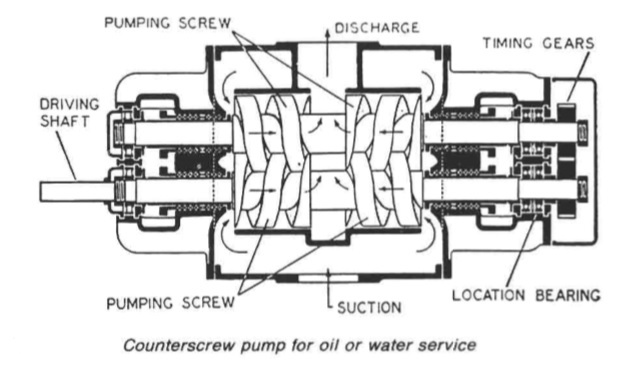 The double-screw pump (Figure 1) shaft sealing is effected by either mechanical seals or packed glands. The shaft seal is at the suction end of the pump, so that seals are subjected only to low pressure or vacuum. Shaft seals must ensure leak-free operation of cargo pumps for toxic and corrosive liquids. Provision is usually made for mechanical seals to be cooled and lubricated by the pumped liquid. For installations in pumproorns an external header may be fitted to service the seal. For the general range of liquids handled, cast iron is suitable for the casing and bearing housings. Screwshafts are normally of high grade carbon steel or stainless steel. Materials having high corrosion resistant qualities such as stainless steel EN 58 J and Hastelloy are used. If screws are not in direct contact they will not be scuffed. Since screw pumps are essentially displacement pumps and will produce increasing pressure until rupture or drive failure occurs it is necessary to safeguard the pump, prime mover and its associated pipework against the event of a discharge line valve closure. The pumps are equipped with full flow relief valves capable of bypassing the entire throughput of the pump. This is for safety purposes only however, and should only operate for a short time otherwise excessive liquid/pump temperatures will result. The valve may be fitted with either manual or automatic control to facilitate starting up under a no load condition. This is necessary where the discharge system is under pressure, to avoid excessive starting torque (electrical load) and long run-up times. Relief valves are also often fitted with automatic volume control valves, which control the output of the pump in order to maintain either a constant pressure or a vacuum at a specific point in the system — as in diesel engine lubricating oil supply — to ensure constant pressure at engine inlet irrespective of oil viscosity. When hot or viscous liquids are handled it may be necessary to preheat the casing of a pump already filled with liquid. Means for heating are available, for example electric immersion heaters or a coil through which low pressure steam or hot oil is circulated. Oil and water separators require delivery from low capacity, smooth flow bilge pumps. The mono purnp, with its corrosion resisting rotor and a stator of natural or synthetic rubber, is frequently used.